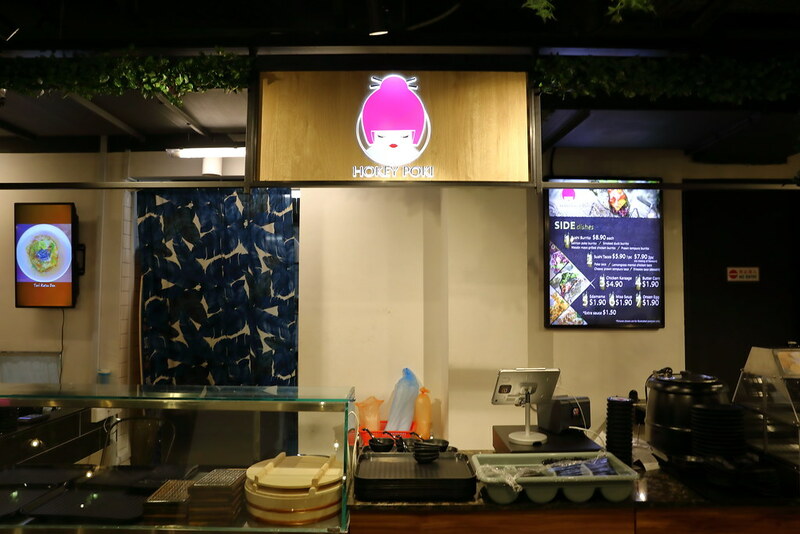 Hokey Poki is a new Japanese fusion stall offering Japanese bowls and sushi tacos at FOMO Singapore. For the Japanese bowls, guests have the choice of building their own bowl with choice of mains, base (rice, salad, quinoa or soba) and optional add ons. As for the sushi tacos, this is a fusion take of the Mexican tacos with Japanese ingredients. 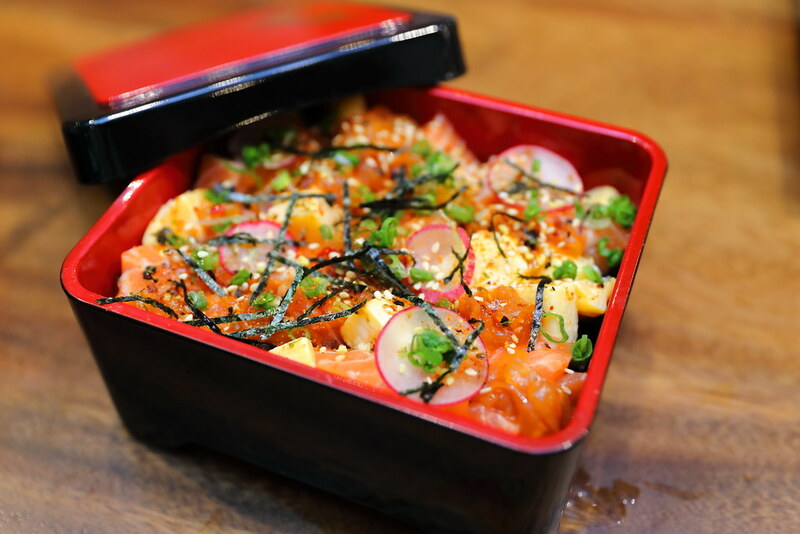 My first choice of the Hokey Bowl is the Salmon Poke ($10.90). I opted for the purple rice which is hidden beneath the pile of seasoned salmon cubes, jellyfish and mango cubes. I like the addition of the mango cubes, which gives it a refreshing finish as well as a textural enjoyment. Other mains on the hokey bowl menu includes Wasabi Mayo Chicken, Laksa Mentai Soft Shell Crab, Cheesy Chicken, Aburi Chirashi, Sambal Shishamo, Aburi Salmon Mentai, Cheesy Soft Shell Crab and Cheesy Prawns. 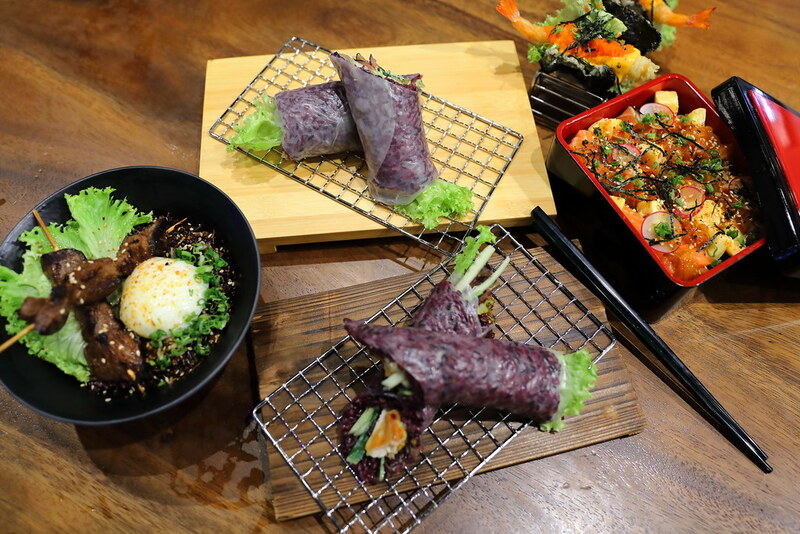 For vegetarians, you can go for the Tofu Delight and Vegetarian Tempura. The Sushi Taco ($5.90 for 1pc, $7.90 for 2pc) is an unique and interesting creation. 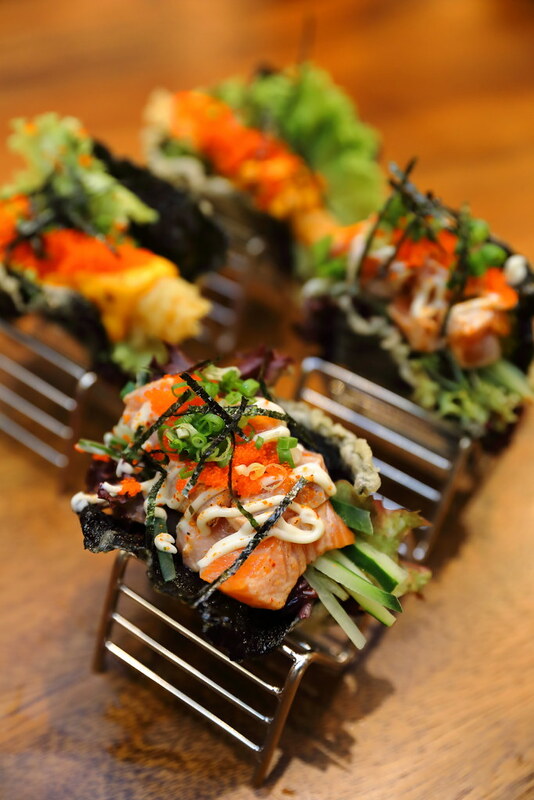 We tried the Cheesy Prawn Taco and Aburi Salmon Mentai Taco. 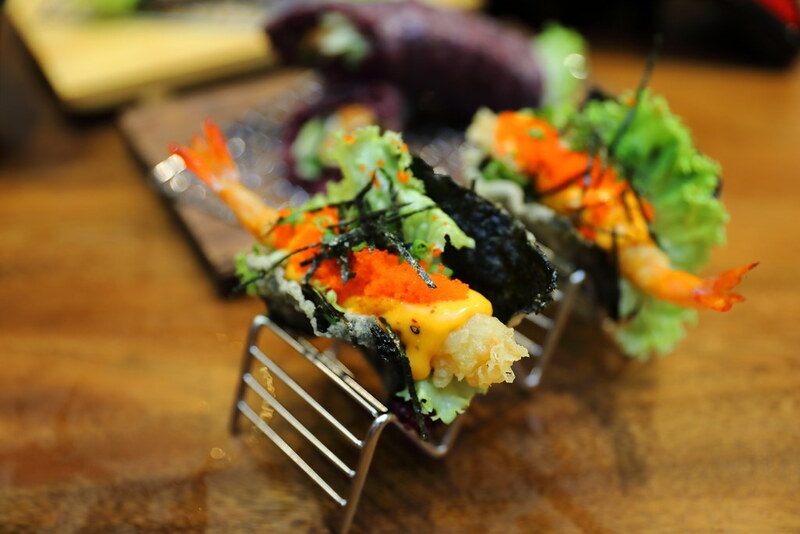 Replacing the tortilla shell is the seaweed cracker sandwiched with Japanese ingredients. The combination and pairing of the ingredients are well thought of. They are really fun and flavourful to eat. Beside the two tacos I tried, there are other interesting taco creations such as Shishamo, Cheesy Soft Shell Crab, Lemongrass Mentai Soft Shell Crab, Lemongrass Mentai Chicken and Cheesy Chicken. On top of the Japanese inspired tacos, there are also Laksa Mentai Prawn, Otah and Sambal Soft Shell Crab influenced by our local cuisine. There is even a dessert taco - S'mores Taco. 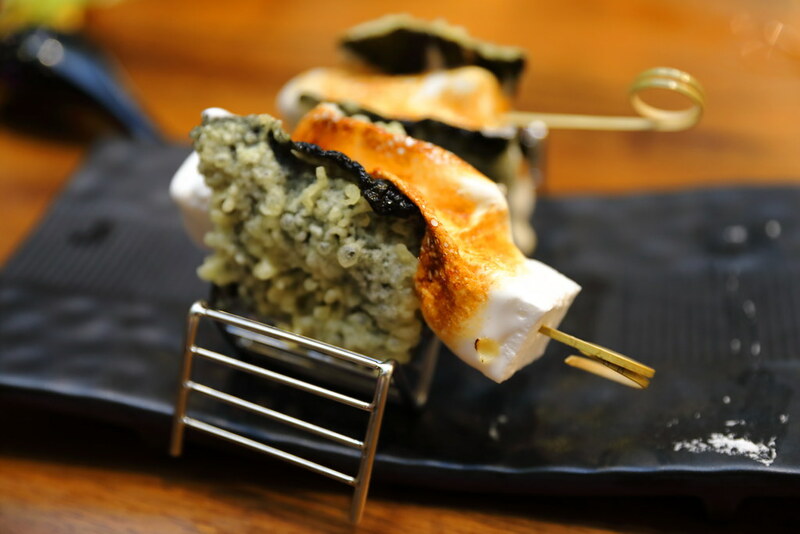 The marshmallow is torched until melt, then it is sandwiched in between the seaweed cracker. Unfortunately I find the combination rather weird. It is also quite difficult and messy to eat. Hokey Poki serves delightful build your own Japanese bowls below $12 which is reasonable priced. Not to forget the healthy choice of salad, quinoa and purple rice. On top of that, the sushi tacos are yummy and unique too.